Sometimes we have to be a Buzzkill. It’s an important part of the job for those who hold a permit or license to sell alcohol. It’s our responsibility to make sure that no one leaves an establishment as a danger to themselves or anyone else. It’s our job to keep our roads safe in an effort to ENDWI. Together we can work to help curb the crisis of drinking and driving in New Mexico. If someone in your party has had too much to drink, please help us slow them down and keep them safe. Even if they’re not driving, it’s illegal to serve them. We want everyone to have a good time. We have a shared responsibility to stop service of alcoholic beverages to intoxicated customers. Their judgment might be impaired. That’s when we all need to use our judgment and help ENDWI. Selling alcohol is an important responsibility. By not allowing intoxicated customers at your store to buy alcohol, you’re helping save lives. Below are some tips on to handle situations that might arise. If an intoxicated person comes into your store, it is illegal to sell them alcohol. New Mexico Prohibits the selling, serving, procuring, or aiding in the procurement of alcoholic beverages to an intoxicated person. All persons selling alcohol on a licensed premise in New Mexico need to complete a class to obtain an Alcohol Server Permit. 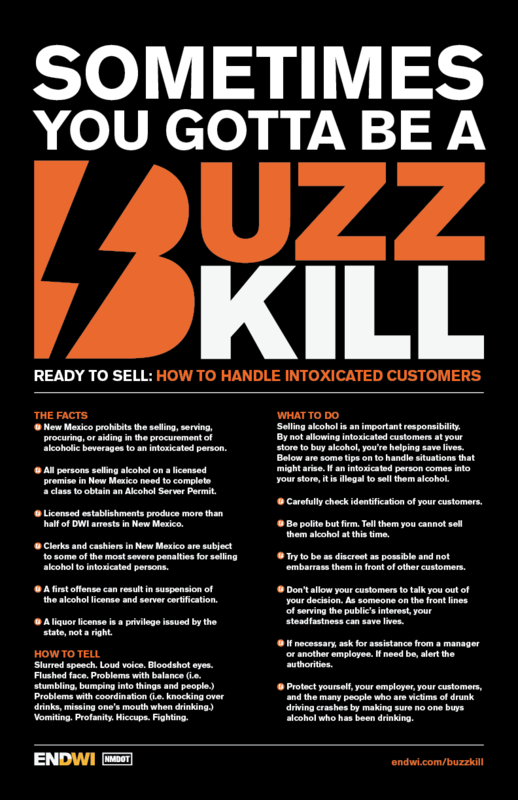 Licensed establishments produce more than half of DWI arrests in New Mexico. Clerks and cashiers in New Mexico are subject to some of the most severe penalties for selling alcohol to intoxicated persons. A first offense can result in suspension of the alcohol license and server certification. A liquor license is a privilege issued by the state, not a right. Carefully check identification of your customers. Be polite but firm. Tell them you cannot sell them alcohol at this time. Try to be as discreet as possible and not embarrass them in front of other customers. Don’t allow your customers to talk you out of your decision. As someone on the front lines of serving the public’s interest, your steadfastness can save lives. If necessary, ask for assistance from a manager or another employee. If need be, alert the authorities. Protect yourself, your employer, your customers, and the many people who are victims of drunk driving crashes by making sure no one buys alcohol who has been drinking. Slurred speech. Loud voice. Bloodshot eyes. Flushed face. Problems with balance (i.e. stumbling, bumping into things and people.) Problems with coordination (i.e. knocking over drinks, missing one’s mouth when drinking.) Vomiting. Profanity. Hiccups. Fighting. 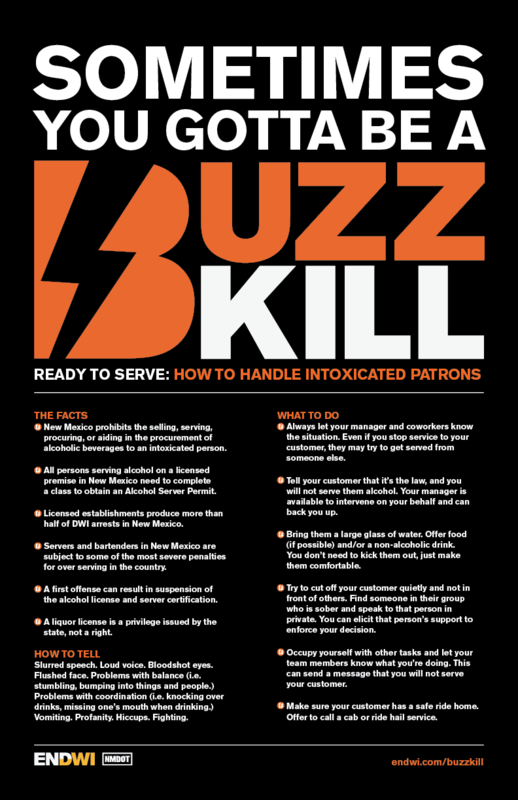 For establishments serving alcohol, there are three downloadable posters guiding servers and clerks with facts and tips to prevent overserving. Posters are for standard 12x18in prints.